When SG-1 finds a crashed alien space ship, Daniel's mind is taken over by its disembodied passengers. SG-1 investigates a crashed alien ship containing hundreds of people in stasis. While investigating various decks, an energy field overwhelms them, knocking them unconscious. Teal’c finds Daniel Jackson at the base of one of the open stasis chambers. When Daniel awakens, he begins to scream. SG-4 brings back the unconscious Jack O’Neill and Samantha Carter, along with a fearful, panicky Daniel. But soon the archaeologist collapses on the ramp as the fear dissolves, replaced with anger. In the medical lab, Daniel is restrained with his hands attached to a belt at his waist. Dr. Janet Fraiser tries to gain information that would explain his condition, but all she gets is a tirade about how this should not have happened. Daniel doesn’t know her. Worse, he says his image in the mirror is not his. Dr. Fraiser explains to General Hammond that Daniel’s E.E.G. indicates multiple brainwave patterns — suggesting multiple minds. Daniel claims to be a Sovereign of Talthus. He has a terrible headache and he makes strident demands in an aggressive manner. Dr. Fraiser gives him painkillers, but these fail to help. For no apparent reason, the personality changes to a crewmember of the crashed vessel. Tryan is an engineer who is more logical and even tempered. Dr. Fraiser questions him more easily, as the personality is surprised at the situation but not afraid. Tryan explains that their world, Talthus, was dying. Several great ships were built to take as many people as possible to a new world, Ardena. However, there weren’t enough stasis units for everyone, so a lottery was held. Each crewmember was allowed to choose one family member to accompany them on the journey. But the trip would be so long that everyone would have to go in stasis. The machines were limited and could not keep a consciousness stored in its own body, so each person’s mind was uploaded to an independent memory module. The ship had been on the planet so long, and damaged so severely, that many people died in stasis. One crewmember, Pharrin, was revived. He tried to save as many minds as he could by taking them into his own body. But there is a limit. When SG-1 arrived, the crewman saw his opportunity and took it. He stored 12 personalities in Dr. Jackson — including that of his own son, Keenin — before Teal’c awoke and had the others removed unaltered. Now, Dr. Jackson is somewhere in the jumble of personalities — unable to separate himself for more than a moment. Tryan explaines it would be impossible to separate the personalities just as it is impossible to return water droplets in the exact same configuration after switching glasses. Knowing there is a crewmemeber at large in the vessel, SG-4 retrieves Pharrin and brings him to the S.G.C. He says there is a way to undo the deed, but it would kill those inhabiting Daniel. Carter explains that Earth has a power source that could stabilize the stasis units long enough to revive everyone so they could be sent to another world of their choosing. But no one will help unless Dr. Jackson is restored. The Sovereign personality, whose name is Martice), emerges to command Pharrin not to take any action against the body of Daniel. In terror, Pharrin kneels before Martice, agreeing not to cooperate with Earth. O’Neill intervenes, telling Pharrin to realize that the Sovereign is dead — as are all the others trapped within Daniel. Unless Pharrin removes their personalities, hundreds of passengers will die. Despite the Sovereign, Pharrin is resistant — his own son is trapped in Daniel. He is allowed a last, touching meeting with Keenin, telling him that they will be able to be together. Pharrin takes Daniel back to the ship to undo the damage. In the process, Pharrin absorbs the personalities, leaving Daniel. The strain of new personalities is enormous. But they will remain intact inside the officer. To the relief of his team mates, Daniel awakens as himself. “‘Lifeboat’ was a story that Brad wanted to tell last year, but because of the type of story it was, it only worked with the Daniel character, which was why when Daniel came back, Brad dusted off the pitch and wrote the script. This is another fun stand-alone, and sort of a tour de force for the Daniel character. 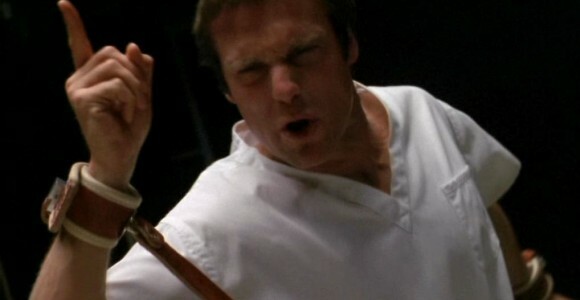 In particular, Michael Shanks gets to show off his acting range. “The team goes off-world and they discover a crashed ship, and within the crashed ship are just hundreds and hundreds of people in stasis. As they’re checking out the ship, they’re knocked unconscious. Teal’c wakes up and discovers that O’Neill and Carter have been moved, and discovers Daniel lying at the foot of one of the stasis chambers. He wakes up, screaming he doesn’t know who the heck Teal’c is. They bring him back to the S.G.C., and it turns out that he has maybe a dozen personalities that have been downloaded into his body, and the Daniel consciousness has been basically buried beneath all these other personalities that are vying for control of his body. “An acting tour-de-force for Michael Shanks who delivers a multitude of terrific performances in an episode that sees him playing several different characters. Guest star James Park’s portrayal of the doomed Pharrin is also incredibly touching and the perfect compliment to Michael’s multi-layered turn. Brad had the idea for this story back in Season Six but, since he’d constructed the story for Daniel who had since left this mortal coil, he’d shelved it indefinitely. When Michael came back to the show the following year, however, Brad was able to dust it off and put it back in play. VOTE! How would you rate SG-1's "Lifeboat?"